Cleopatra Records loves doing these tribute albums, typically with Billy Sherwood in charge. That works out well because I love these albums and love reviewing them. 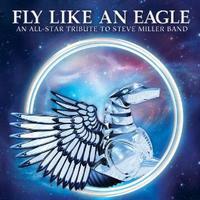 I’ve always dug the music of Steve Miller and therefore I looked forward to this one. I’d say that overall it’s one of the less proggy of the bunch, but there are enough bits of prog and enough progressive rock people involved here to land it in that category. Of course, Billy Sherwood is one steady feature here. He’s on all the songs except the last one. My individual track reviews will include the featured artists for the various cuts, but overall, there are a lot of great guys here. This isn’t the best of these they’ve done, but it’s still pretty great. It should be mentioned that Peter Banks contributed to one of the songs here. He passed away between recording it and the album coming out, so in some ways this could be looked at as a tribute to him, too. There’s a cool vibe to this tune. It’s got the Steve Miller song structure pretty much intact, but there is a real fusion, funky kind of feeling in the arrangement. I can almost make out some hints of Southern rock, too. Featured musicians include Colin Moulding and Tony Kaye. I really dig John Wetton’s vocals on this thing.The other featured artist here is Steve Stevens on guitar. The tune again isn’t that far removed from the original version. I’d actually say that in a lot of ways the arrangement here is closer to the original than the opener was. There is some tasty guitar work on this thing. Now, the opening section of this is seriously turned into a smoking hot prog rock jam. The song proper has more straightforward rock in place, but there are instrumental bits of real progressive rock magic as this continues. This features Fee Waybill and Derek Sherinian. Wow! This is cool! It’s got a real funky vibe to the vocal performance (John Parr) and the bouncy keyboard sound is great. Rick Wakeman gets a couple suitably trademark keyboard solos, bringing the prog in spades. Until the keyboard driven instrumental section later in the piece, this one doesn’t do all that much for me. That said, it’s never been one of my favorite Steve Miller tunes, anyway. That closing extended instrumental section, though, is great and quite definitely prog. Martin Turner does the vocals on this and Geoff Downes handles the keyboards. I really like this one a lot and it lands thoroughly in progressive rock territory. That said, the original wasn’t far from prog, anyway. Peter Banks is responsible for the lead guitar on this while Sonja Kristina provides the vocals. This isn’t one of the proggier pieces here, and frankly it’s one that’s just alright. It’s not all that special. John Wesley is the featured musician on this tune. Now, this one, on the other hand, just plain rocks. It’s not overly proggy, but it’s great. Joe Lynn Turner delivers a great vocal performance and Steve Morse provides a guitar solo. This is awesome. Jimi Jamison and Jordan Rudess are the featured musicians here. It’s got the rocking edge, but the prog keyboard soloing brings the progressive rock in style. Here’s another killer rocker that’s got plenty of prog in the mix. I don’t think I like this one as much as the original version, but it is quite cool. The vocals are delivered by Rod Argent while Steve Hillage handles the guitars. This has always been a rather proggy tune, so it should be no surprise that it works in a more progressive rock oriented setting. In fact, it works very well. This is one of the more effective pieces here and a great way to end it all in style. Nektar is the main artist on this tune, but Geoff Downes adds some extra keyboards to it and Joel Vandroogenbroeck plays flute and yet more keys.